Fundamental to a Lees-McRae education is recognition that learning happens in and outside the classroom. And there is no better way to gain experience than through immersion in the world around us. Follow a staff writer as she joins the President in reflection on his time at the College. "Lees-McRae was on a trajectory of failure," President Barry M. Buxton stated plainly to me as we sat across from one another in his cozy office early one grey morning. These were his first words to me during what would become many conversations together. The occasion? Come May 2018, Buxton will leave his post as president. An ever-curious storyteller, I made it my mission to learn as much about him as possible before he packed his personal belongings and left the historic Rock House. Explore the cutting-edge technology that will prepare the next generation of medical professionals at the May School of Nursing and Health Sciences. His breathing is almost inaudible—only creeping through the seams of the ambulance doors. It's rhythmic, steady and accompanied by a curious clicking noise. The source of the breathing and blinking is not human. It's Hal. Dr. Herbert L. King, Jr. to succeed Dr. Barry M. Buxton as 16th president of College. We are Bobcats—Lees-McRae is our foundation, our home and where we are inspired to succeed—it is in all of us, and it is who we are. Dr. Amber McNamara's story of finding herself, falling a little and flying effortlessly—as shared from one scientist to another. Take in a wide view of the College—including academic programs, activities and achievements. What are the chances that two Lees-McRae alumni would meet on a project caring for an injured osprey that was over 2,000 miles from home? Perhaps it is a little higher than you would think. Even though they both followed similar academic paths in college, Shylyn Pierce ’16 and Yaritza Acosta ’12 had never met or even heard of one another. It wasn’t until an exhausted juvenile Western Osprey landed in a heap on a sandy beach in Miami Beach, Florida, that the odds of the two meeting would increase. Learn more about Pierce, Acosta and the wayward raptor that brought the two together for the coincidence of a lifetime. Programs in Health and Wellness Science and Outdoor Recreation Management have been introduced in Banner Elk. They continue the institution’s commitment to its mountain location and service to the surrounding community. A program in Business Administration has also come online—literally. It joins other distance learning programs that allow working professionals to earn a degree on their schedule from their computer. The Southern Association of Colleges and Schools Commission on Colleges approved all three baccalaureate programs and has included them in the existing accreditation. Jess Bellemer knits…a lot. Once she even injured her arm by over-knitting. Only after months of rest, many doctor visits and physical therapy, was she safely able to knit again. How did this all happen? At 16, Bellemer decided to learn to knit. With no one to teach her, she went to the local library and picked up a book. That visit spawned a new reference-seeking lifestyle and with the support of librarians she found more and more about her hobby. With that information, Bellemer grew as a knitter who could knit while reading, walking and sitting in meetings. Her trips to the library not only led to life as a knitter but also as a librarian. As a graduate student, Bellemer realized how much she enjoyed assisting her classmates with their in-depth research. It was this awareness that led to a career in libraries where she has been able to help students discover information on everything from Plato and modern social justice movements to parasites and Appalachian literature. As the Director of Library Services, Bellemer prefers that students not think that trips to the library could end with them being physically injured. Rather, she hopes they will come back time and time again prepared to explore and to discover. Bellemer became a librarian out of love for the process of finding information. She is always available to assist students in finding that perfect article for their research papers and maybe even a new obsession of their own. After all, the library is the best place to start anything. When invited to court, most people would have some anxiety; however, if you are a student in the Criminal Justice program, that couldn’t be further from the truth. A group of nearly 20 students from Lees-McRae traveled to the Avery County Courthouse in nearby Newland, North Carolina, to participate and practice in two mock court trials. Students played each role within the proceeding including the attorneys, jury members, clients, audience members, clerks and the judge. The first trial mimicked a typical civil case involving a speeding ticket. The second trial practiced the steps in a criminal case including evidence, witnesses and deliberation by the jury members. For some, it was the perfect opportunity to experience two intricate court processes. For others, it was a chance to try their hand at their possible future profession. The Outdoor Recreation Management program launched a new, three-part, campus-wide Green Initiative, led by students known as the Green Team. A $3,000 BB&T Leadership Initiative grant, with the sole purpose of bringing leadership opportunities to campuses nationwide, will give the Green Team the ability to implement a recycling plan for both residence halls and academic buildings, a community garden and compost program. Lees-McRae proudly embodies the motto—In Montibus, Ex Montibus, Pro Montibus—which translates to in the mountains, of the mountains, for the mountains. The College’s history is deeply rooted in the Appalachian Mountains, and as inhabitants, it is crucial to ensure the mountains remain for future generations. Lees-McRae was again recognized among the best regional colleges in the South. Rising to No. 19 in 2018, the institution outpaced similar institutions on the ranking. The College was also named to the Best Value list for the first time. Acknowledged for engaged students, great teaching, a vibrant community and successful outcomes, Lees-McRae was named a College of Distinction. Programs in Business, Education and Nursing were awarded for extraordinary professional academics. The League of American Bicyclists named the institution a Silver Bicycle Friendly University. By prioritizing cycling awareness, safety and advocacy, Lees-McRae joins eight other designated schools in North Carolina. A Wake Forest University graduate and North Carolina native, McNair Tornow joined the Board of Trustees in 2012. After serving as Vice-Chair for several years, Tornow assumed the position of Chairman last year. Tornow’s role as a trustee comes after a life-long career in law and time in the military during the Vietnam War. Tornow continues to practice law in Banner Elk and Winston-Salem, North Carolina. Tornow and his wife, Debi, have a permanent home on Beech Mountain where they spend quality time with family including four children and five grandchildren. The Tornow family can often be found courtside during basketball games cheering on the Bobcats. Deeply connected to the Lees-McRae athletics program, they helped make the renovated McNair and Debi Tornow Court possible. At approximately 11 p.m. on Feb. 26, 2017, flames began to fill rooms within the Williams Physical Education Center. Originating in the laundry room, a blaze stormed its way from locker room, to office, and then through the halls, leaving only black soot and charred remnants in its wake. In all, the fire and smoke caused more than $2 million in damages. For the Lees-McRae community, news of the devastating fire the next morning came as a bombshell—especially for those athletes, coaches and staff members who call the gym a second home. To go on without Williams Gymnasium was not an option. Almost immediately, work begin to restore the space and make it better than it had ever been before. Seven months, and several-hundred hours of hard work and dedication later, the facility reopened; however, it did not look the same as it once did—it looked better. Renovation not only included the essential rebuilding of the structure’s integrity, but also a newly refurbished weight-training room, film room, laundry room and the resurrection of the long-unused pool. In many ways, the Williams Gymnasium fire became a catalyst for change, a test of true strength and evidence of the unbreakable bonds the Lees-McRae family possess. 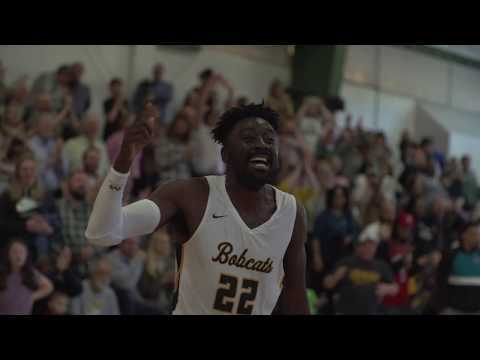 The men’s basketball team made history on March 4, 2018 with a victory against Belmont Abbey to become Conference Carolinas champions. That win capped off a record-breaking 23-win season and gave them an automatic bid to the NCAA Division II Tournament for the first time in program history. Congratulations on a great season, Bobcats! Watch the video and relive the moment. On Aug. 21, 2017, Lees-McRae mourned the loss of legend, Fred Irvin Dickerson. At the age of 106, Dickerson epitomized Bobcat spirit until his passing. Born May 6, 1911, the Greensboro, North Carolina, native attended Reidsville High School before pursuing higher education. At the time, Lees-McRae College was only a junior college, which meant students only attended for two years. Dickerson graduated with his fellow 13 graduates in 1931. While at Lees-McRae, Dickerson quickly made his mark in the athletics history books. He played basketball, track and football. He quarterbacked the first Lees-McRae football team and scored the first touchdown ever by a player with an 83-yard kickoff return. Following Lees-McRae, Dickerson went on to receive his bachelor’s degree from Davidson College and his master’s degree from Louisiana State University. During that time, he continued to excel in athletics by competing in football, basketball and track. His post-college days were rich in leading higher education athletic programs as well as time spent in the U.S. Navy during World War II. Dickerson’s professional experience spanned 43 years and included positions at Mars Hill Junior College, Davis and Elkins College, Mars Hill High School and as Lt. Commander in the U.S. Naval Aviation Cadet Training Program. During the 43-year span, Dickerson worked at Lees-McRae twice for a total of 19 years. First as the athletic and physical education director from 1933 to 1936 and again as the director of athletics and physical education from 1946 to 1962. In October of 1979, the Fred I. Dickerson Athletic Complex was named after him, and years later in October of 2000, the Fred I. Dickerson Athletics Hall of Fame was dedicated to the life-long athlete, mentor, coach and colleague. Ally Murphy returned to campus to present a speech titled, Dream Big, during the 2017 Convocation event in Hayes Auditorium and Broyhill Theatre. Before starting her cycling career at Lees-McRae in 2008, Murphy—neé Stacher—was a student-athlete on the women’s wrestling team at Lassen College in Susanville, California. After becoming badly injured while wrestling, Murphy found a new home on the bicycle. She focused her natural ability and quickly moved up the ranks in the world of women’s cycling, ultimately joining the U.S. National team in 2009. She went on to become a member on one of the top teams in the world by 2011 for four years. During those years, Murphy was a part of many victories individually and with a team across the globe. During her time at Lees-McRae, Murphy was honored with the Carla Swart Sportsmanship Award, which is presented to the female rider who sacrifices their own chances at victory for the good of their team. In 2015, she was inducted in to the Fred I. Dickerson Hall of Fame for her impressive accomplishments both during her time on the College cycling team and in the elite and professional cycling ranks. After racing around the world for several years, Murphy eventually decided to hang up the bike to focus on her family and pursue other passions. Delivered straight to your inbox, the Lees-McRae quarterly newsletter features College news, event information and more. The Pinnacles is published by the Office of Marketing and Communications. Please send all communications, including letters to the editor and questions, to communications@lmc.edu.